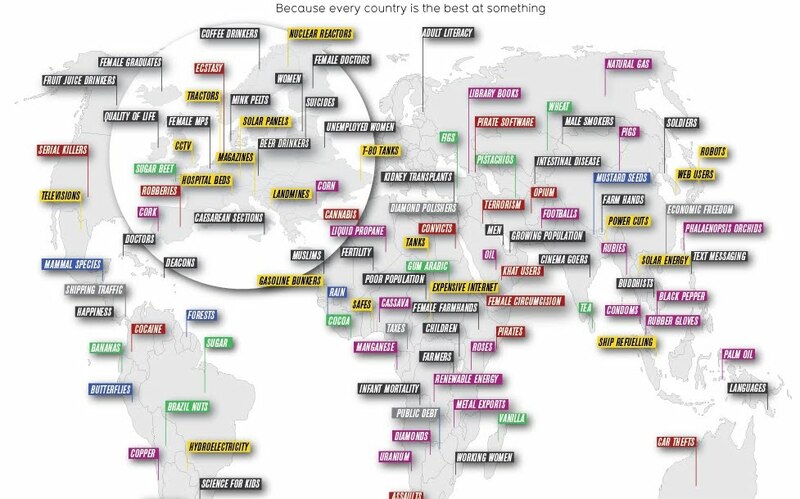 Rural Revolution: "Because every country is best at something..."
Here's an interesting schematic illustrating what various good and not-so-good things each country in the world is best at. Growing population? Liquid propane? Butterflies? Cinema goers? Serial killers? Rubber gloves? Televisions? Now that is interesting. I have been to Uganda and yes they are good at having children. I have been to Rwanda and I can tell you that every square inch of the country is under cultivation. I have never seen such beautiful fields. And Canada is a country that is good at drinking fruit juice?